Masks, which function to conceal a person's face, occur in a variety of forms and can be made from numerous kinds of material, including wood, cloth, and vegetable fiber (the three most common) as well as paint, metal, clay, feathers, beads, bark cloth, and plastic. Masking is an ancient tradition, dating back to the Paleolithic sculpture and cave painting of southwestern Europe (30,000-15,000 B.C.E.) and to rock paintings from the Tassilli area of northern Africa (4,000-2,000 B.C.E.). 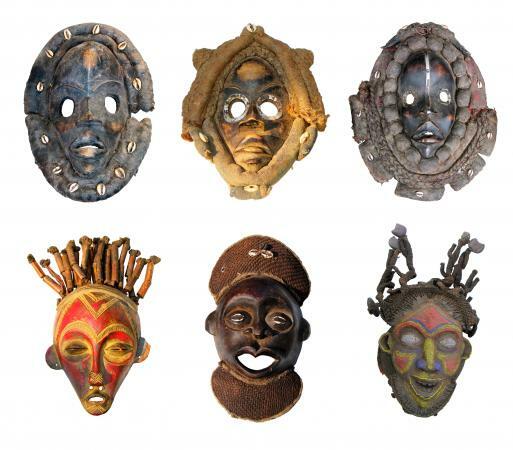 The Tassilli masks appear very similar to types that are still being worn in West Africa. Additional examples of early masking can be found in rock painting located in parts of Asia and North America. Masks cover all or part of the face and have been used for many reasons. Some masks function to protect an individual. In the fifteenth and sixteenth centuries, Japanese, European, and Middle Eastern armor included a helmet that safeguarded the head and, in some examples, also frightened an enemy. Numerous other kinds of protection masks exist including gas masks, hockey masks, and space helmets. Yet masks usually imply a type of disguise or transformation in which a person's identity or appearance is clearly altered. Anonymity is often desired when a person acts in an antisocial or criminal manner and does not wish to be recognized. This would include bank robbers, members of terrorist organizations-including the Ku Klux Klan-and revelers that appear on festive occasions, such as Halloween, Carnival, or Mardi Gras. In a number of examples, a mask may allow the wearer to transcend his-or in some cases her-ordinary physical nature and take on the identity of another creature, ancestor, or supernatural force. In fact, the majority of masks are associated with ceremonial or ritual activity of a social, religious, economic, or political nature. In a performance context, they often express the otherworldliness of the spirits and make visible what is invisible. Such masks tend to act dynamically when they appear either to a few initiated individuals or to a larger segment of the population-moving, speaking, or gesturing in a dramatic fashion. When considering masks of this category, it is best to employ the more inclusive concept of masquerade, since a masquerade involves more than concealing the face of a person. In most cases, it consists of a total costume functioning within a performance context. The costume may also include objects held or manipulated by the masquerader, which function as props in the performance or help clarify the character's nature. The creation of a masquerader can require the specialist talent of many individuals, and the actual performance requires the involvement of additional people, such as dancers, musicians, masquerade attendants, and audience members. The exact function and meaning of every mask is culturally determined. A mask may have different functions through time or it may have two or more functions at any given time. The focus of this entry is on what masks do and what they mean in different sociocultural systems. The structure presented below suggests one way that masks can be organized into functional categories. In both Europe and Asia, there is a tradition of covering the face with a mask for theatrical productions. Festivals in ancient Greece used masks, made from linen, cork, or lightweight wood, for both dramas and comedies. For tragedies, masks depicted highborn men and women as well as gods. Animal, bird, and insect masks were only found in comedies. Roman culture continued to utilize theatrical masks and from the sixteenth to the eighteenth centuries, Italian and French touring troupes employed masks or half masks to exaggerate the traits of stock characters in popular theater (commedia dell'arte). The improvised performances were never subtle but usually quite bawdy. Satire or social commentary is a feature commonly associated with masking traditions. A connection between ritual and theater is strongly evident in Asia. Indonesian face masks are used widely for dramatic performances honoring ancestors and telling stories with a moral or historical reference. A spectacular example can be seen with the Barong-Rangda dramas of Bali that depict the age-old conflict between the forces of good and evil. These masks have sacred power and when not in use must be stored in a temple. Rangda, the queen of the witches, represents the forces of evil and both her mask-image and costume are viewed as frightening. She has a long mane of hair with flames protruding from her head and a fierce face with bulging eyes, gaping mouth, huge teeth or tusks, and a long tongue. Around her waist is a white cloth, an important instrument of her magic. Rangda's opponent in the play, Barong-a defender of humanity, can be presented in a range of animal forms. The most sacred type of Barong is called Barong Ket, a shaggy-haired creature with large eyes, grinning mouth, and a huge curved tail embellished with a red flap and tiny bell. His face is overwhelmed by a huge headdress with large earflaps. In Japan, No developed from rice planting and harvest rituals to theatrical performances that deal with social issues that spotlight past events, supernatural beings, and contemporary concerns. Men wearing lavish costumes and small wooden face masks with serene, neutral expressions perform all the roles. No masks, carved from Japanese cypress wood, represent young and old men, young and old women, deities, and demons. The specific character is brought to life through subtle movements of the actor's body. Actors have a long period of training, wearing their first mask-in a supporting role-as an early teenager. By the time he is sixty years old, an actor is permitted to play a major character that may wear more than one mask during a single performance. Halloween has evolved from an Anglo-Saxon and Celtic ritual, to become a major American masking event involving both children and adults who wear costumes that depict aspects of popular culture, political issues, cross-dressers, social transgressions, or personal fantasies. In some communities adults have organized elaborate street fairs and parades to celebrate the holiday. For many college towns, Halloween has become a major public event associated with revelry. Among a number of cultures, masquerades are seen as the embodiment of the vital powers of the wilderness and its inhabitants. A major concern of the Baining of New Britain (Papua New Guinea) is the transformation of the products of nature into social products through collective human activity. Baining masks, representing spirits, usually consist of a variety of large bamboo frames covered with beaten tree bark and decorated with leaves, feathers, and elaborate patterns, painted red and black against a white background. All of the designs are named, usually after different types of trees, plants, or creatures of the bush. The mask ensembles refer back to the natural domain and during the dances they mediate between the bush and community. The masks in part derive their importance from the fact that they are made out of bush material that has been transformed by human work into finished products. Although there are many types of masquerade, all can be organized into two broad categories: day dances and night dances. Day dances are associated with females and the gardens while night dances relate to males and the bush; not every village has both. These night masks, consisting of a wide variety of plank and helmet types, are named after products of the bush, especially those that men hunt and gather. The day masks, on the other hand, are usually tall, vertical structures up to forty inches high. The designs on these masks relate to the growth of domesticated plants. The Kalabari Ijo of the delta area of Nigeria believe they share their environment with water spirits (Owu) who play an important role in providing benefits to the community. Throughout West Africa, spirits of the water are seen as more positive and more helpful than spirits associated with the forest or wilderness. For the Kalabari, wooden masks are used in the ritual cycles that honor these spirits associated with a body of water, usually a creek. Although each water spirit has its own costume, music, and dance, and appears at different points in the festival, they all dance together at the end of the ritual cycle. Water spirit masks, in the form of fish or other aquatic creatures and humans, are worn horizontally on the head and are characterized by a swollen forehead, a long nose, and a projecting mouth. The masqueraders also wear a costume made from different layers of cloth. 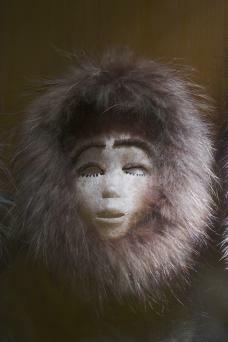 The masks of the Alaskan Eskimo populations function to provide protection from potentially dangerous nature spirits and to ensure successful hunting. For the Eskimo, animals are not just food products but spiritual beings that must be treated with respect. They believe that all natural forms have a soul (inua) that will usually reveal itself to a person in the form of a small, human-like face on the back, breast, or in the eye of a creature. Masks represent supernatural beings who control the forces of nature, the spirits of particular mammals and fish, or natural phenomena such as air bubbles, a particular season, or even the wind; their specific form is based on the dream or trance of a shaman (religious leader who has an extraordinary ability to intercede with the spirits). Masks, normally made from driftwood, are created by shamans or by carvers working under their direction; they are found in a variety of shapes including a basic human face, an oval form with some facial features, or abstract forms full of distortions and additive features. Twisted mouths, eyes of different shapes, peg teeth, encircling hoops, feathers, miniature legs, arms, small animal forms representing the shaman's spiritual helpers, sometimes frame the face and project outward into space. Masks are used in dances and elaborate winter ceremonies, which take place in the men's house and the ceremonial center of a village. A mask is usually worn by the shaman or by someone he selects and, in large part, is designed to appease the animals killed and to ensure that they continue to reproduce. Among the Bamana of Mali, the powerful Komo association is a high-level institution, under the leadership of blacksmiths. It functions to protect the community against sorcerers and other malicious beings. The Komo horizontal helmet mask is carved and worn by a blacksmith at special secret night ceremonies. The Komo mask is a conglomerate medicinal assemblage that moves swiftly and aggressively like a wild beast. It essentially functions as a wooden support for many different kinds of power substances. Protective amulets and feathers that symbolize the celestial realm, antelope horns that symbolize the power and mystery of the wilderness, and porcupine quills that symbolize knowledge are added to the Komo mask as they are believed to constitute the necessary ingredients to effectively combat sorcery. Moreover, the surface of the mask is impregnated with kola juice, millet, and chicken blood, all of which contribute to the awesome power and frightening appearance. The girl's four-day puberty rite of the Apache is more than an initiation ritual as it is significantly concerned with the well-being of the entire community. This ceremony invokes the benevolence of the deity, Changing Woman, to bring good fortune to everyone in the community. On the second night of the puberty ritual, Gan masqueraders, wearing plank headdresses made of slats of yucca or agave stalk and a black cloth hood (originally buckskin), impersonate mountain spirits who bless the area and help protect the community from dangers and disease. Originally the mountain spirits lived with ordinary people, but in order to avoid death, they fled to the mountaintops to seek a world of eternal life. Before departing, the mountain spirits taught the Apache how to conduct the curing ceremonial and how to construct the appropriate costume. The headdresses are painted with black, blue, yellow, and white with patterns that protect the dancer from evil forces. During the curing ceremony, both the Gan spirits and the initiate are able to purify the community and expel illness. The Society of Faces of the Iroquois (New York and Ontario) use masks in the communal longhouse during the mid-winter ceremonies to drive away disease and to cure those who are sick. Private curing ceremonies can also be performed in the house of a sick person. Once someone is cured by the masks, he is able to join the society. Most masks portray humanlike spirits that reveal themselves to people in dreams or by suddenly appearing in the forest. These medicine masks also participate in seasonal renewal ceremonies held in the spring and fall. At this time they run through the village, shaking rattles, to cleanse the community from all afflictions. The masks are empowered to heal an individual and to protect an entire community from the evil that supernatural powers could inflict upon it. The carved masks are usually made from basswood, but other soft woods can be used. Ideally, a mask should be carved from a living tree. Only men are permitted to carve and wear the False Face masks. Horsehair, paint, and metal to surround the eyes are applied to the wooden face. Most masks depict capricious forest spirits that have come to serve human beings with their medicine power through gifts of food and burnt tobacco offerings. Cornhusk masks, on the other hand, worn by either men or women, are used in curing ceremonies, which follow those of the wooden masks. Iroquois women create them by sewing together coils of braided husks; they represent vegetation spirits responsible for the renewal of growth from season to season. The Hopi of northern Arizona have established a yearly ceremonial cycle divided into two parts. The first from the winter solstice in December to mid-July is marked by kachina ceremonies. Five major and numerous one-day ceremonies are held during this time. The purpose of a kachina performance is the bringing of clouds and rain but it also includes promoting harmony in the universe in order to ensure health and long life to the Hopi. Kachinas, who are invisible forces that reside in the San Francisco Mountains, are associated with clouds and rainfall. All in all, there are about 250 kachinas, but only 30 are major ones. 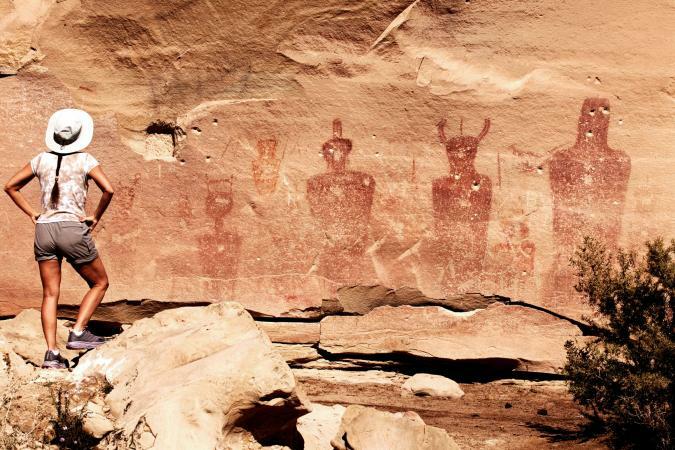 During the winter, kachinas participate in rituals held in the ceremonial center (kiva). When spring arrives, kachina dances are held in the village plaza. In the intervals between dances, when the main kachinas are resting, clown kachinas enter the plaza and afford comic relief. The cycle ends with the home dance (Niman), a sixteen-day ritual that begins just before the summer solstice. Although any kachina can participate, it is normally performed by a group of Hemis kachinas, characterized by an elaborate wooden tablita (crest form) depicting rainbow, cloud, sun, and phallic images. The tablita surmounts a case mask, usually half of it painted green while the other half is pink. The body of the impersonator is painted black and decorated with light-colored half moon motifs. The best-known mask type of the Bamana of Mali is the Chi Wara, a graceful and decorative carved antelope, which appears when the fields are being prepared for planting. The primary purpose of the Chi Wara association, also concerned with the training of preadolescent boys, is to encourage cooperation among all members of the community to ensure a successful crop. Always performing together in a male and female pair, the coupling of the antelope masquerades speaks of fertility and agricultural abundance. The antelope imagery of the carved headdresses was inspired by a Bamana belief that recounts the story of a mythical beast (half antelope and half human) that introduced agriculture. The male antelopes are decorated with a mane consisting of rows of openwork zigzag patterns, and gracefully curved horns, while the female antelopes support baby antelopes on their backs and have straight horns. These headdresses are then attached to a wicker cap, which fits over the head of the masker, whose face is obscured by black raffia coils, hanging from the helmet. Many societies in different parts of the world institutionalize the physical and social transformation that boys and girls undergo at the time of puberty in order to ritually mark their passage from childhood to adulthood. In the West African country of Sierra Leone, Mende girls begin an initiation process into the female Sande association where they learn traditional songs and dances and are educated about their future roles as wives and mothers. After successfully completing all initiation obligations, the girls dress in fine clothing, form a procession, and parade back to town led by Sande members and a masked dancer who represents a water spirit and symbolizes the power of the Sande association. In Africa, the Sande is unique in that it is the only documented association in which women both own masks and perform masquerades. The Sande masked dancer wears a costume of black raffia and a carved helmet-type mask. The masks-characterized by fleshy neck rolls, delicately carved features, a smooth, high forehead, and an elaborate coiffure-is seen as expressing a Mende feminine ideal. The shiny black surface of the mask alludes to the flowing river, the water spirit's home when the Sande association is not in session. As part of the puberty ceremony carried out among Sepik River peoples in New Guinea, boys undergo a period of seclusion during which masks depicting bush spirits appear. After appropriate training, the newly initiated boys enter a men's meetinghouse, the political and religious center of the community, and in the open space in front of the meetinghouse, initiation dances are held. Various mask types appear at this time, ranging from face masks to large fiber costumes to which wooden faces can be attached. Leaves and large orange fruits can also be attached to a costume. Most of these masquerades impersonate clan or bush spirits. Among the Kwakiutl of the northwest coast of America, male initiation rituals take place in large ceremonial houses during the winter months. The most important Kwakiutl initiatory society is hamatsa, the cannibal society, which cuts across family and clan ties. After spending time in the forest and being introduced to the spirit world, a young man must be formally reintroduced back into society. This reentry is a four-day public event featuring dancing, singing, and masquerading. Masked dancers of animal and human form represent spirit beings associated with particular kinship groups or with the wilderness. The most theatrical of masks are those capable of transforming into another form. In this case, a single mask will have more than one identity. This feat is accomplished by the dancer who manipulates strings to open the outer mask to reveal another face within. An important component of this event is the appearance of large mythical cannibal bird masks, such as Raven and Crooked Beak of Heaven, who reside in the north end of the world. These enormous masks with a movable mouth are worn on the dancer's forehead at an upward angle. Kwakiutl masks, which have large bulging eyes, heavy curved eyebrows, and flat, rectangular drawn-back lips, are often embellished with broad geometric painted patterns. The most frequently used colors are black and red; blue-green and yellow are also found. Masks from the Dan, a politically noncentralized group in southeastern Liberia, function primarily as agents of social control. In the nineteenth century, these masks provided the only unifying structure in a region of autonomous communities. Dan masks, known as gle (spirit), derive their authority from the possession of supernatural power. For the Dan, a spirit will select a man to be its owner by coming to him in a dream or vision, instructing him to have created a specific style of mask and costume. Stylistically these masks can be divided into two basic types. The first type, called Deangle is an oval face form with recognizably human features, representing a female spirit. These masks portray a gentle, peaceful spirit whose attributes of behavior are seen as feminine. The costume of the Deangle mask normally consists of a conical headdress, a commercially made cloth draped around the shoulders, and a raffia skirt. A second type of mask, Bugle, which represents male forest spirits, is grotesque and enlarged with tubular features and angular cheek planes. In general, Bugle masks are responsible for important social control functions such as judicial decisions, law enforcement, criminal punishment, fine collection, and military supervision. Although a Deangle mask may begin its life history in an initiation camp or as an entertainment mask, its status can become elevated to that of a more powerful judge mask. Moreover, any Dan mask can function as the powerful great mask, which settles important matters like stopping wars between villages. When a mask assumes greater social control responsibility, its costume will change to reflect a new status and personality. The Bamilike and Bamun kingdoms of the Cameroon grassfields perform masquerades owned and danced by men's regulatory associations responsible for maintaining social order. The most important regulatory society of the Bamilike is Kwifyon, which serves to support the royal establishment, but also counterbalances the power of the king by playing an important role in government, judicial administration, and policing activities. Grassfields wooden masks depicting human beings are characterized by rounded faces, prominent cheekbones, bulging almond-shaped eyes, and semicircular lateral ears. They exhibit considerable variation in form, ranging from a crest worn on top of the head to helmet forms with carved elaborate headdresses revealing symbols of authority. Attached materials, such as shells, beads, and brass, indicate high status. Animal masks symbolize important attributes of leadership and power, particularly the leopard and elephant. The Kuba kingdom located in the Democratic Republic of the Congo has developed a masking tradition to function in a leadership context. The three principal royal masks, Mashamboy, Ngaddy a mwaash, and Bwoom, may dance separately at royal initiation and funeral ceremonies or perform together when portraying the mythological establishment of the Kuba nation. Mashamboy, the most important royal mask, represents the legendary ancestor who founded the ruling Kuba dynasty. The mask's structural frame is made of wicker, covered with leopard, and cowrie shells. The second mask (Ngaady a mwaash), which symbolizes the sister-wife of the legendary ancestor, is a more naturalistic wooden face with slit eyes. It is decorated with an overall pattern of painted striped and triangular motifs, seeds, beads, and shells. The third mask (Bwoom) represents a person of modest means or the nonroyal members of the society symbolically balancing the royal establishment. The Bwoom mask is a wooden helmet decorated with sheets of copper, hide, shells, seeds, and beads. Although the added materials enhance the mask, the carved form itself makes a powerful aesthetic statement. See also Carnival Dress; Ceremonial and Festival Costumes; Masquerade and Masked Balls. Cole, Herbert, ed. 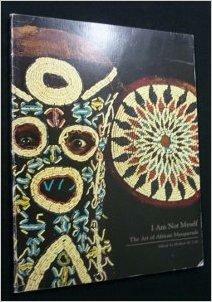 I Am Not Myself: The Art of African Masquerade. Los Angeles: Museum of Cultural History, 1985. Colleyn, Jean-Paul, ed. Bamana: The Art of Existence in Mali. New York: Museum for African Art, 2001. Corbin, George. Native Arts of North America, Africa. and the South Pacific. New York: Harper and Row, 1988. Fienup-Riordan, Ann. The Living Tradition of Yup'ik Masks. Seattle: University of Washington Press, 1996. Jonaitis, Aldona, ed. Chiefly Feasts: The Enduring Kwakiutl Potlatch. New York: American Museum of Natural History, 1991. Mack, John, ed. Masks: the Art of Expression. London: British Museum Press, 1994. Napier, David. Masks, Transformation and Paradox. Berkeley: University of California Press, 1986. Perani, Judith, and Fred T. Smith. The Visual Arts of Africa: Gender, Power, and Life Cycle Rituals. Upper Saddle River, N.J.: Prentice-Hall, 1998. Pernet, Henry. Ritual Masks: Deceptions and Revelations. Columbia: University of South Carolina Press. 1992.